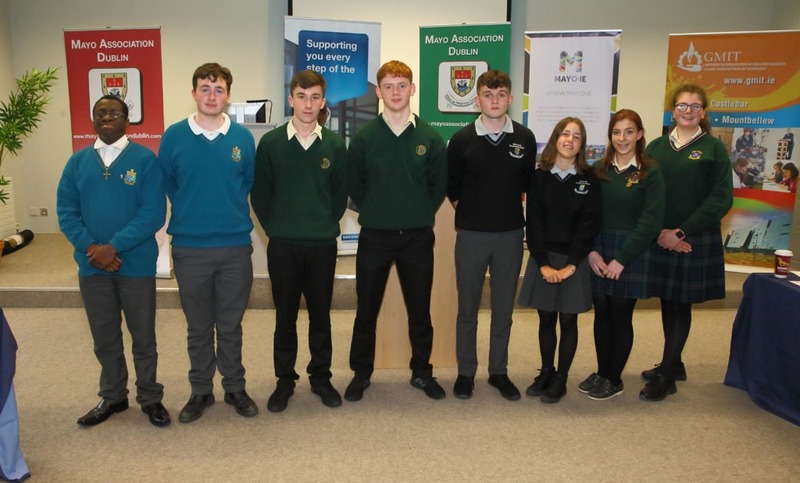 GRAND FINAL TO DECIDE ON MAYO STUDENT DEBATERS FOR 2018! ‘THAT THIS HOUSE BELIEVES THAT THE STORY OF CINDERELLA IS NO LONGER SUITABLE FOR OUR CHILDREN’ will be the motion up for debate at the Grand Final of our Mayo Schools’ Debating Competition, which takes place in Trinity College Dublin on Saturday 17 November. 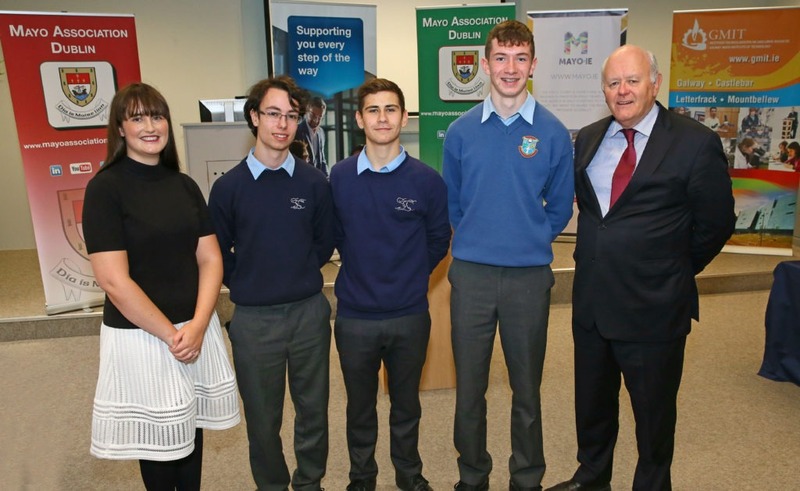 This year’s semi-finals at GMIT Castlebar on 20 October again attracted a very high standard from both team and individual speakers from schools across the county, and now it will be time for an independent panel of adjudicators to decide on who will take home the Perpetual Trophy at our prestigious Grand Final in Trinity College next Saturday. and St. Marys Secondary School, Ballina. INDIVIDUAL SPEAKER FINALISTS: Fleur Griffin (St Louis Community School, Kiltimagh); Seán Connelly (Scoil Muire agus Padraig, Swinford); Hazel O’Grady (Sancta Maria College, Louisburgh); and Tadhg Murphy (St Gerald’s College, Castlebar). Following the Grand Final, the perpetual trophy will be presented to this year’s ‘Winning School Team’ together with a medal for the ‘Best Individual Speaker’ of the competition, which will be decided upon by our panel of adjudicators – Ms Justice Mary Laffoy (who will chair the panel), former TD Pat Rabbitte; Iarla Mongey, Director of Q4PR; Dr Carmel Heaney of GMIT and former Chair of Mayo Association Dublin; and Padraic Lyons BL, former convenor and finalist of The Irish Times debate. The competition again carries the proud patronage of former President of Ireland, Dr Mary Robinson (current Chancellor of Trinity College Dublin). And we also wish to sincerely thank Bank of Ireland (Mayo) and Mayo.ie for their renewed and invaluable sponsorship of this event. So, we look forward to welcoming you all to what promises to be another enthralling final. 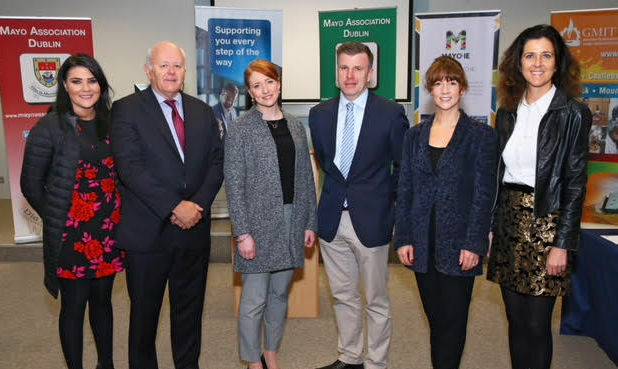 Pictured (l-r): Caroline McCann, Bank of Ireland; Michael Kealy, Treasurer of Mayo Association Dublin; guest judge Anne Marie Flynn, freelance writer; Neil Sheridan, Mayo County Council; Dr Carmel Heaney, Lecturer at GMIT and former Chair of Mayo Association Dublin; and guest judge Senator Michelle Mulherin. 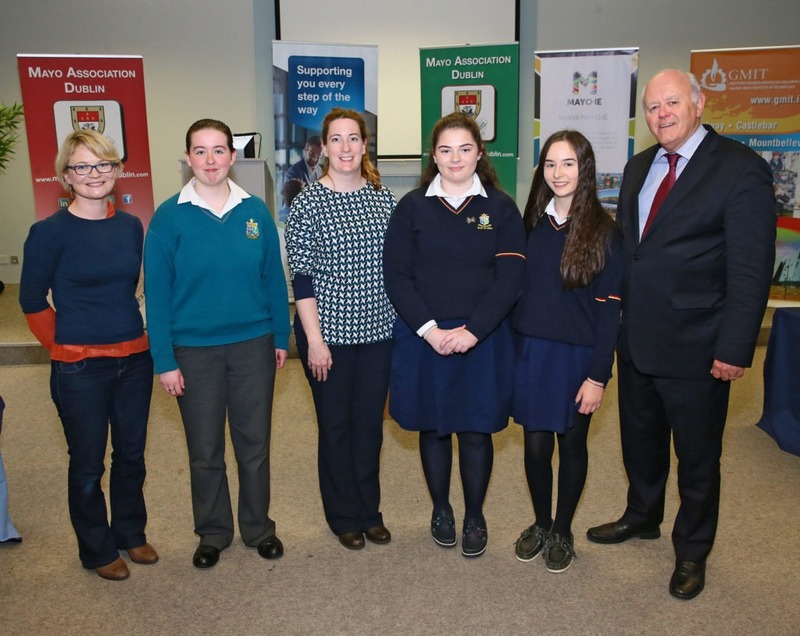 Mayo Association’s Michael Kealy pictured with teachers and students Hazel O’Grady (Sancta Maria College Louisburg), and Jennifer Burke and Laura Campion (St Mary’s Secondary School Ballina) who will go through to the final. 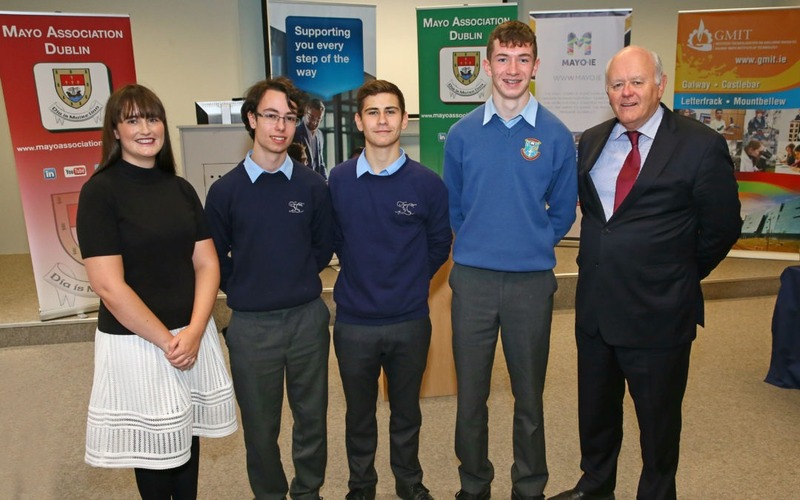 Pictured (l-r): Mayo Association Dublin’s Laura Daly; finalists Vasco Casimiro & Iosaf Devine McHale (St Gerald’s College Castlebar) and Sean Connolly (Scoil Muire agus Padraig, Swinford) and Michael Kealy. 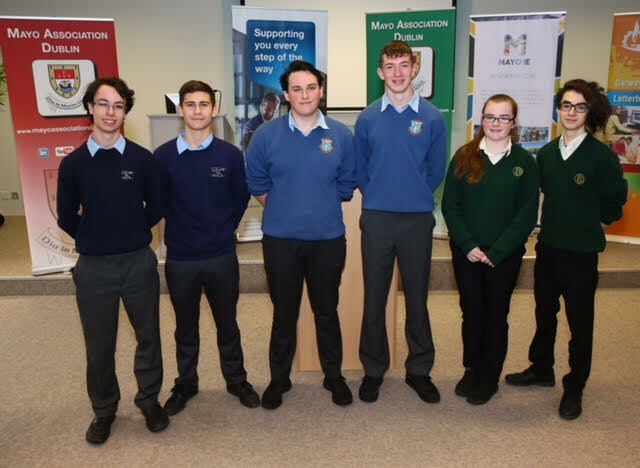 Team members from Sancta Maria College Louisburg, Davitt College Castlebar, Ballinrobe Community School and St Louis Community School Kiltimagh before the semi-finals got underway at GMIT Castlebar last month. Pictured before the start of the semi-finals, team members from St Gerald’s College, Castlebar, Scoil Muire agus Padraig, Swinford, and Davitt College Castlebar.